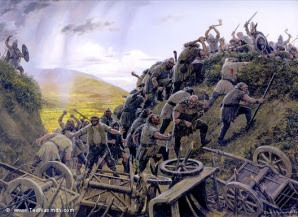 The Battle of Bywater (3 November, 1419 Shire Reckoning; 3019 TA) was the final battle of the War of the Ring, and the second battle to be fought in the Shire (the first being the Battle of Greenfield in 2747 TA). Saruman had sent a group of ruffians to suppress the Hobbit revolt in Bywater; having received advanced warning from Hobbit-scouts, the Hobbits in Bywater devised a plan to entrap the ruffians upon their arrival. The ruffians tried to fight their way through, and while some managed to get past, the majority of them were encircled and forced to engage in battle with a Hobbit-force led by Meriadoc Brandybuck and Peregrin Took. Samwise Gamgee and Frodo Baggins were also present, though instead of fighting, Frodo made sure none of the Men who surrendered their weapons were killed. The Hobbit-force was successful in defeating the agents of Saruman and driving them out of the Shire. Seventy ruffians, nineteen Hobbits, and about a hundred of the Chief’s Men were killed during the battle. On the day after the Battle, Frodo, with the Hobbits of the Shire, marched to Hobbiton, where he confronted Saruman (here referred to as Sharkey), exiling him from the Shire. Wormtongue then killed his Master by slitting his throat; and in turn, Wormtongue was shot dead by several of the Hobbits. Savage side of them Hobbitses.